Interactions within the cyberspace is one of the main focuses of our project. The participants will be equipped at the entrance with an ad hoc device created with open source technology provided by Raspberry Py on by the OS Raspbian. With those two, the user can register to our system’s social network which was created following our ideas on how we wanted to build this system. Inside this controlled cyberspace the user can conversate with others, share photos, videos, share ideas, reflections, express emotions and to participate actively to various forums open to anybody and that they will grow by number each and every time somebody wants to discuss about something that hasn’t been already talked about. The system works by analyzing the data generated by the users inside the social network, so that we can show the importance of Big Data in this day and age. The system consists in three different clusters of machine learning algorithms, each containing different analysis rule to divide the data coming from the server’s database. One set of rules is used to analyze the data collected in the social network’s forums. On other set of rules are think for control the data related to the user’s sharing action. One last set of rules are programmed to make sentiment analysis on the basis of the behaviors of the users into the cyberspace. This workflow is the central brain of the system. Now, some questions could come from this kind of schedule: musicians and artists will be replaced by this kind of AI? Or the field of the art and the music will be one of the lucky few that won’t be touched by this substitution? 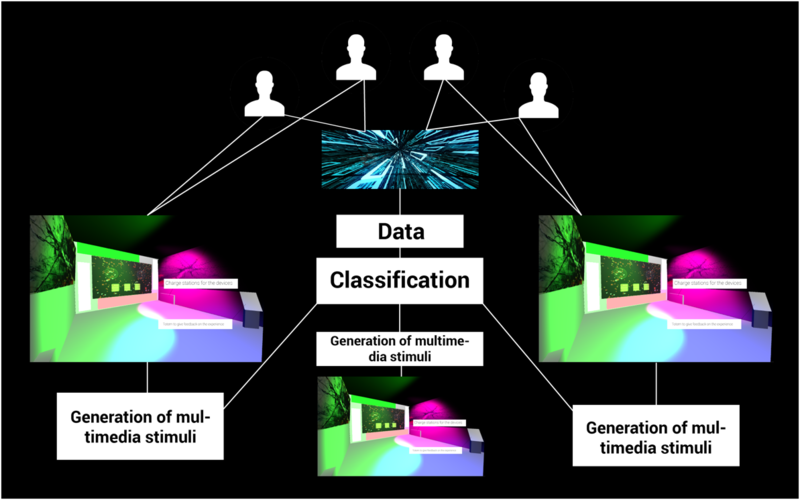 This system could be a test from which make prediction, especially by observing the social behavior of the visitors. Each room is dedicated to a precise analysis method. One room analyses the content and interections inside the forums, another one analyses the data published inside the social network (posts, photos, videos, comments, reactions, ecc…), and the last one does a sentiment analysis, so it analyses the users mood. The perception of the digital space, which is the center of the experience, it is done by visuals and audio content. The data analysed are used to increase some counters, the values of which are fed to three different control patches programmed in Max/MSP, and each one of them is linked to an analogic instrument rank which are composed by a bass station, a drum machine, samplers and modular synthesizers. The parameters of each instrument are controlled by MIDI signals generated from the three different patches. The sound is mixed naturally and it is sent to the correct listening room. It is important to point that the control it’s executed in every single parameter of the related instruments. Every mixer is equipped with an input to a recorder, which the purpose of this recorder is to create the specific tracks and to create a mixtape of the songs / sounds that are generated during the event. The mixtape will be given to the users at the end of the experience. The visual part of the system feeds of the analysis of the sound coming inside the room. Using processing inside each one of the rooms, the systems will show graphics that will adapt to the sound that comes in the room. For the project, which is still in a development stage, we accept suggestions and some constructive critics about the project, but we’d like to still keep the roots of a system that gives entertainment to the public and has the goal to make people realize the importance of tools like social networks, which are at the base of the age we are in.